This was the second National Schoolgirls Tournament to be held and Sponsored jointly by the Dedanists’ Society and the LRTA. 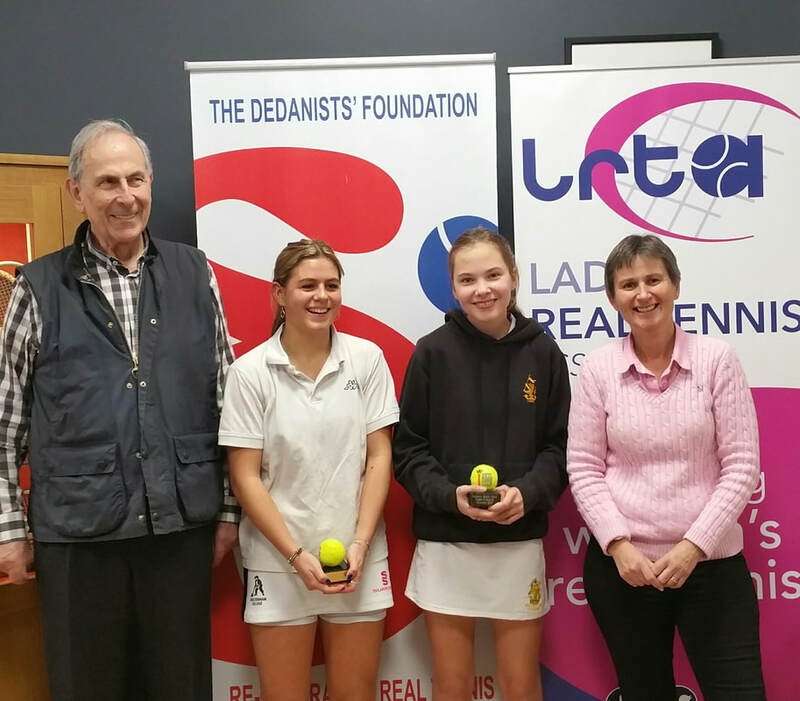 This year doubles events were added to both the U19 and U15 singles events. The U15 Singles had a wonderful 19 entrants. 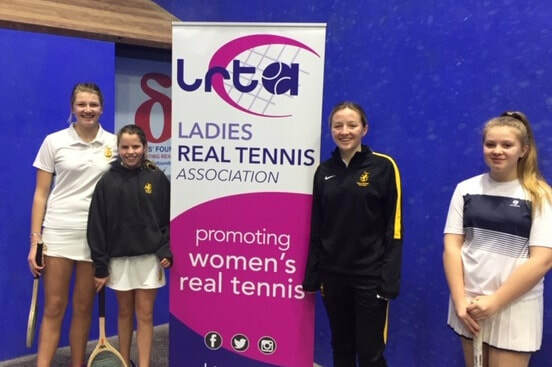 Three singles groups played on Friday evening and finished playing at 10.45pm and a further 2 groups on Saturday morning to feed players into the semi-finals. It was so exciting to see all the girls’ standard of play improve as they experienced more tennis. The first semi - final saw Cesca Sweet v Lucy Bryer both Wellington College. Cesca already possesses 4 or 5 very effective different serves and she raced to a 3-0 lead. Lucy showed that she has a good eye for the ball and started to prolong the rallies winning more points but not sufficiently enough to win a game. Cesca pressed on to take the set 6–0 also showing that she is very tactically aware by hitting the ball into the galleries to gain the serving end and by playing many shots into the backhand corner from the receiving end. The second semi-final was between Olivia Boulton (Oaklands RC) and Honor Hue–Williams (Wellington). In this match Olivia hit a variety of accurate serves and was very consistent off the floor. Honor has a good eye for the ball and hit some good returns of serve but Olivia played well to pick them up and took a 4–0 lead. At this point Honor began to really attack the ball with especially sharp returns of serve in addition, hitting her serve to a better length enabling her to take a couple of games. Olivia then managed to come back down to the serving end and closed out the match 6–2 with some difficult length serves. Cesca v Olivia was an excellent final. Cesca immediately started with some super length serves which Olivia did well to pick up to make it 1–1. However, a lot of the great retrieves by Olivia were back down the middle of the court and Cesca would finish off the point with a glorious cross court backhand to just in front of the tambour. Olivia frequently hit some great shots only for Cesca to hit something even better. At 3–1 Olivia started hitting to a better width and played some terrific volleys taking the next game and then nearly took the next game to make it 3 all. However, Cesca started attacking again and it was her turn to hit some glorious volleys and forge to a 5–2 lead. A close final game with some magnificent retrieving by both players saw Cesca eventually take the game and the U15’s title 6-2. The U15 doubles had an entry of 9 pairs. The group matches saw lots of exciting rallies and again the rallies became longer as the girls gained more match experience. 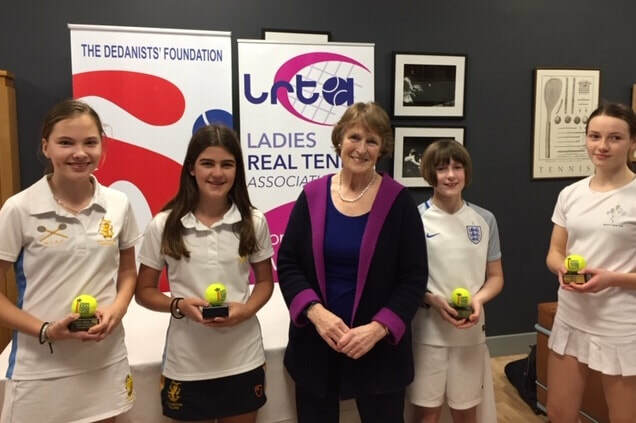 The first semi–final saw Lucy Bryer and Marina Hammond (both Wellington) v Katie Walker and Olivia Boulton (both Oaklands RC). This was a very level match throughout, 2 all, 3 all, 4 all with many games going to deuce. The final 2 games were nail biting both going to final point deuce and Olivia and Katie emerging as 6–4 winners. 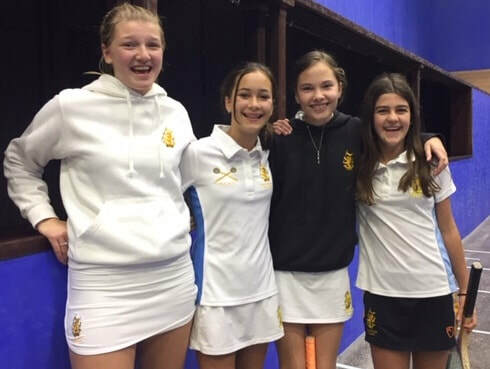 The next semi–final saw an all Wellington affair with Cesca Sweet and Honor Hue Williams v Ottilie Perkins and Lily May Redshaw. 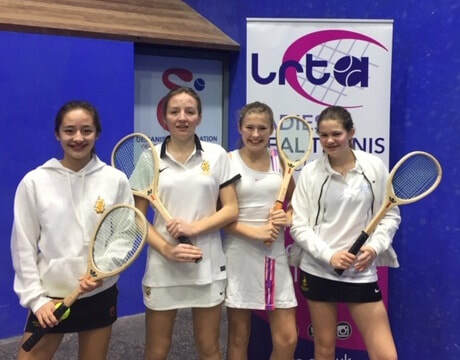 Cesca and Honor raced to a 3–0 lead before Ottile and Lily May got down to the serving end. They served well to take the next game to make it 3-1. However, Cesca and Honor quickly regained the serving end to take the next 3 games and the match 6–1. The final saw some cracking tennis with super shots hit by all four players and the level of play becoming stronger and stronger as the match progressed. Cesca and Honor quickly took a 2-0 lead then Olivia hit some excellent returns of serve into the forehand corner to take the next game. Honor then got her own back and also hit some great returns for her and Cesca to take the next game and have a 3–1 lead. Olivia and Katie then hit some excellent attacking ground strokes and volleys to bring the score back to 3–3. A tight seventh game with lots of long rallies that went to deuce game point saw Cesca and Honor take a 4–3 lead. The next 2 games saw Cesca continue to serve beautifully and Honor play very steadily and in particular volley superbly to defend the dedans and they took the next 2 games and so the title 6-3. The U19 events were played all day on Sunday. In the singles we had 9 players in 3 groups competing to reach the finals. After some highly competitive group matches our first semi–final saw Cesca Sweet v Lauren Gooding (Wellington). Two such talented players; both are attacking and in possession of great timing and with great hands. Right from the start there were some ferocious rallies with Cesca serving accurately and Lauren hitting into the corners to a good length. The first 3 games went to 40 all and it was Cesca who took a 2–1 lead. Lauren continued to volley well but Cesca introduced a greater variety and even tighter serves and this caused Lauren to start making mistakes and become a little tentative on her left handed backhand. Cesca eased away to a 6–1 win but the score certainly did not reflect the quality of the match. The next match was Olivia Boulton (Oaklands RC) v India Deakin (Cheltenham College). India steadily progressed to a 5–0 lead with a variety of accurate serves, solid volleying and some excellent retrieving, hardly making any unforced errors. Olivia found it difficult to hit the ball to any width until the 6th game when she suddenly found her touch, hitting balls into the corners so putting India under pressure and winning the next 2 games. Then it was a close final game finishing with a tight serve from India making Olivia lift the return up for India to hit a scorching backhand volley to the base of the tambour. So, to the final; India v Cesca. This was a magnificent final with the game see–sawing throughout. A close first game saw Cesca win it with 2 beautiful shots straight into the dedans. Crafty deft serves by India and it was soon 1-1. Cesca then took a 3–1 lead with some great shots into the corners which forced India to make a few unforced errors. India pulled back to 3–3. Suddenly, India stormed to a 5-3 lead by staying at the serving end and with some fantastic shots to just in front of the tambour going around the back of Cesca. Then India eased up with her tight serving allowing Cesca back into the game and it was 5–5. Clever serving by Cesca saw her pull back from love 40 down and take a 6–5 lead. Then India took the next game with some brilliant retrieving and it was 6–6. The next game went quickly to Cesca for her to lead 7–6 but India struck some great serves forcing errors or lifted shots from Cesca and it was 7–7 and a few racing hearts in the dedans. In the final game India went to a 30–15 lead but Cesca laid 2 chases. At this point Cesca served 3 soft rail roads in a cunning change of pace and direction to force errors from India and so win 8–7. A fantastic match of superb quality and showing loads of talent from both players. 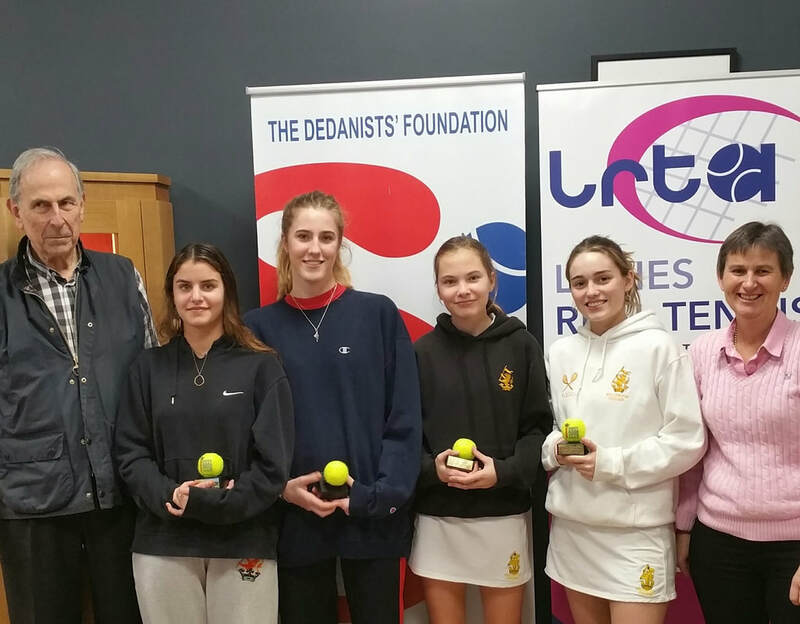 The U19 Doubles was an all Wellington affair with one group of 3 pairs and with the top 2 pairs going through to play the final. 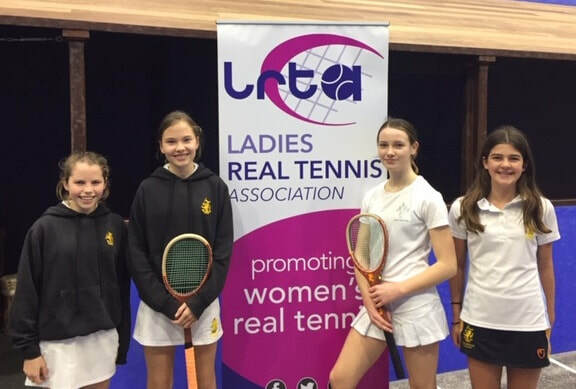 Cesca Sweet and Honor Cockcroft were clear group winners and Daisy Bristowe and Arabella Spraggs snuck through as group runners–up with a 7–6 win over Maisie Ringer and Mollie Johnson. Initially it looked as if this was going to be a one-sided final, with Cesca and Honor going to a 3–0 lead. All the players were attacking the ball and hit some awesome volleys. At this stage Arabella started hitting some great length serves putting Honor under greater pressure and she and Daisy crept back into the game and it was 2–3. 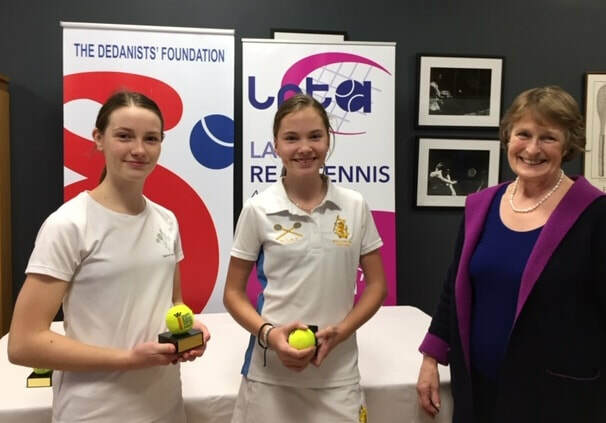 However, Cesca and Honor stopped making errors, retrieved well and with Honor defending several shots that were going into the dedans, they went on to take the set and the title 8–4. A huge thank you to Wellington College for allowing the tournament to be held on their court. A massive thanks to Dan Jones and Adam Player for all their marking throughout Friday, Saturday and Sunday plus creating such a fun tournament. In addition, thanks to Simon Roundell for various behind the scene administration, bouts of marking and making sure that we were all plied with copious cups of coffee, super sandwiches and cake throughout the weekend. Our thanks too to Josh Farrell for presenting the prizes on Sunday. What an exciting weekend of tennis!